In 2017, South Africa’s agricultural exports grew past US$10.0 billion for the first time, boosted by growth in exports of edible fruits, beverages, spirits, vegetables, grains and other agricultural products. This is a 15 percent increase from 2016 – a year that was characterised by El Niño induced drought. From a destination point of view, Africa and Europe continued to be the largest markets for South Africa’s agricultural exports, collectively absorbing 67 percent of total exports in 2017, measured in value terms (see featured image). In more detail, Africa remained South Africa’s largest market, accounting for 42 percent of agricultural exports, which is a percentage point increase from a five-year average share. The sector’s export growth to the continent was led by relatively competitive industries such as beverages, cereals, fruits, sugar and vegetables. Trailing Africa was the European Union region which absorbed 25 percent of South Africa’s agricultural exports in 2017, up by 13 percent from the five-year average share. South Africa’s agricultural export growth to this region was also led by industries such as beverages, wool, sugar, fruit and animal fats. 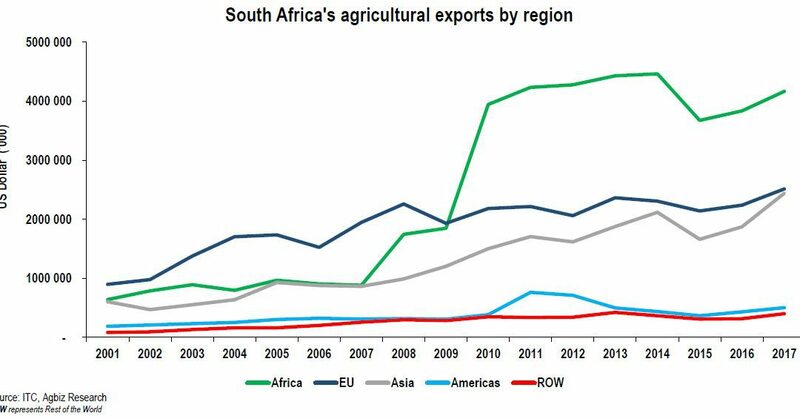 Asia is also an important market for South Africa’s agricultural exports, demanding a 24 percent export share in 2017, up by a third from the previous year. Wool, fruit, grains, beverages, vegetables and meat were the leading products exported to this particular region. The Americas and the rest of the world accounted for 5 percent and 4 percent shares, which are 3 percent and 14 percent increases from 2016 exports, respectively. Exports to these regions were also dominated by fruits, beverages, sugar, flowers and ornamental foliage.